I* understand and agree that upon approval of the Obama Credit Card, I am then rendering my soul, giving government ultimate power over mine and my families lives. I also understand that this takes away all Constitutional rights and privileges, as politicians will be allowed to make all decisions for my being. I understand that the transaction of soul, rights and privileges is permanent and non-reversible, therefore I will be dependent and owned by the government for the rest of my pitiful existance. If I later choose to become a productive working contributor of society, I must close or stop use of this credit card. I am expected to immediately resume payment for all purchases made during ownership of this credit card, which I will unlikely be able to do, resulting in either losing everything and living on the streets or crawling back in desparation to the government begging for dependency again. *"I" refers to the person who is named Primary on the credit card application. Price of one Promoter Package: $19.99 + your soul. Cash for Clunkers: Your Path to Profit? The government must be doing something with all these clunkers they are buying up. 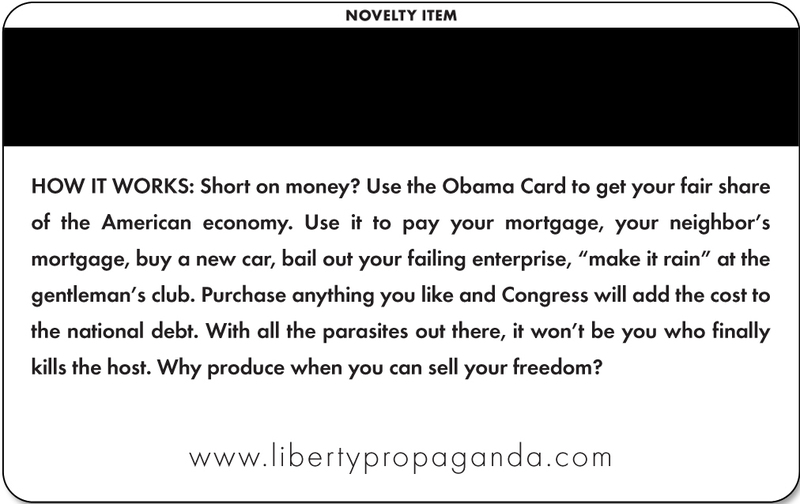 Why not start a junkyard that will soon need a bailout? Make a few strategic donations to your favorite members of Congress, and you might be on the recieving end of these "distressed assets." Make up some bull about having a new, greener way to strip these badboys down and turn the frames into organic compost. 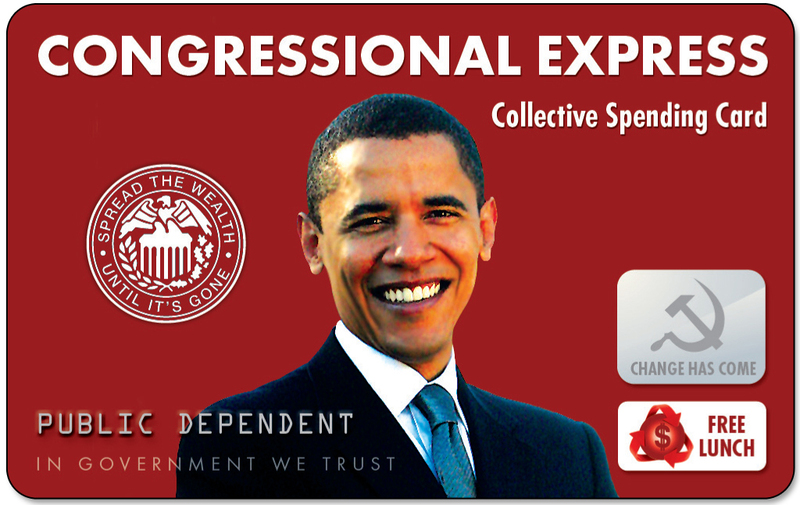 Get yourself a line in the budget (or an Obama Card!) to cover expenses; then, lose a ton of money (on the books, anyway) and ask for a bailout from the already approved stimulus money! Finally, abandon the property, pull a Bobby-Sue and take the money and run! Keep donating to Congress to keep any nasty investigations from ruining your fun. Help promote automatic abundance--befriend Liberty Propaganda on facebook. Don't forget to green your wardrobe, buy some carbon credits to offset the environmental impact when you exhale, or invest some R&D in recyclable toothpaste; you don't have to pay for it--Obama is president! 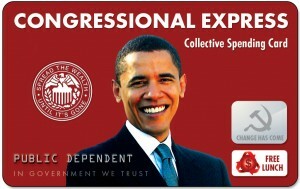 Obama Card Hits the Streets! Liberty Propaganda teamed up with Corruption Database to distribute "free" healthcare at Sheila Jackson Lee's healthcare townhall. Participants from both sides were amused and intrigued with their new automatic abundance. After all, if Congressional Express is accepted at the gentlemen's club, it should certainly finance your next gastric bypass!